Soup has been on the mind lately with the weather turning colder. We actually had a little bit of rain on Saturday which inspired the making of this batch. There's something about that first bit of rain each fall that is so welcomed. It's like those first few hot days of summer. They haven't been around in so long that you are just dying for them to come along. I've been making a soup like this since I started cooking in college. It has changed much over the years, but the basic idea remains the same. Roasted tomatoes, pureed into a wonderful and warming dish. Halve the tomatoes and peel and quarter the onions. Remove the stem and seeds from the bell pepper and cut into large chunks. Place all the vegetables on a greased baking sheet and roast for 25 minutes until the edges start to char. Remove to a large pot and add stock. Tie the dill sprigs together with kitchen twine and add to the pot. Bring to a simmer and let cook for 30 minutes. Remove the dill sprigs and let the vegetables cool slightly before transferring to a blender and pureeing. At this point you can strain the soup, but I prefer to keep the thickness you get without straining it. Return the soup to the pot and add the heavy cream and salt. Split between six soup bowls and garnish with dill and creme fraiche. Enjoy! This sounds really great. You can't go wrong with a nice bowl of soup when the weather turns a bit colder. It's funny-I'm not a fan of tomatoes raw and on their own, but love them in a nice soup. This looks great! 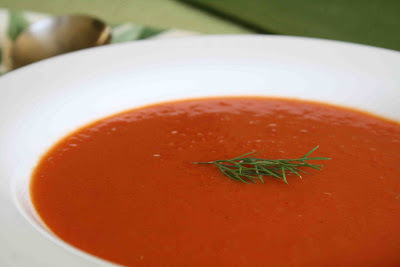 Tomato soup is one of those dishes that I go for when I am chilled to the bone. I love that yours has dill. We were predicted to get our first frost last night, so I picked all of the tomatoes I could off of my overgrown patio tomato plant. Now I know exactly what to do with them. When it comes to tomato soup I'm a little strange. I have to drink it out of a mug, no bowl for me. So tomorrow night I'll be sipping on some roasted tomato soup. This looks so lovely for fall and winter! Just give me a grilled cheese sandwich too! Oh my goodness! That looks so warm and comforting! Wish I sould have this for lunch today! ooooh yummy! Nothing hits the spot like a bowl of warm tomato soup. I love tomato soup with a grilled cheese sandwich! Classic comfort food! I can almost smell the wonderful tomato fragrance of your lovely soup. I just picked up a box of tomatoes at the farmer's market so will give it a try. That looks so good! Our weather (I'm in California) is only barely starting to get cold. I can't wait for "soup" season (I love eating soup when it is cold outside) which will be here soon! Mike and Hopie - My thoughts exactly. In a strange way I'm actually looking forward to some cold weather. Tanya - Too funny. My boyfriend won't eat tomatoes on their own either, but he will go for tomato soup! Michele - Warm soup in a mug. Sounds like the prefect way to enjoy this soup. The Food Librarian - That's exactly what this bowl is missing. A gooey grilled cheese sandwich to go along with it. Meg, Rachel and Maria - It was very comforting and satisfying. Those kind of days make me want to stay on the couch all day with comfort food. Wives with Knives - Sounds like perfect timing! Let me know how it comes out. Juliet - I'm in California too, but we actually got out first rain on Saturday. Of course now it's back up to 80!